Today I have another Thai recipe for you. We love Thai, if you haven’t figured that out by the amount of Thai food we eat. 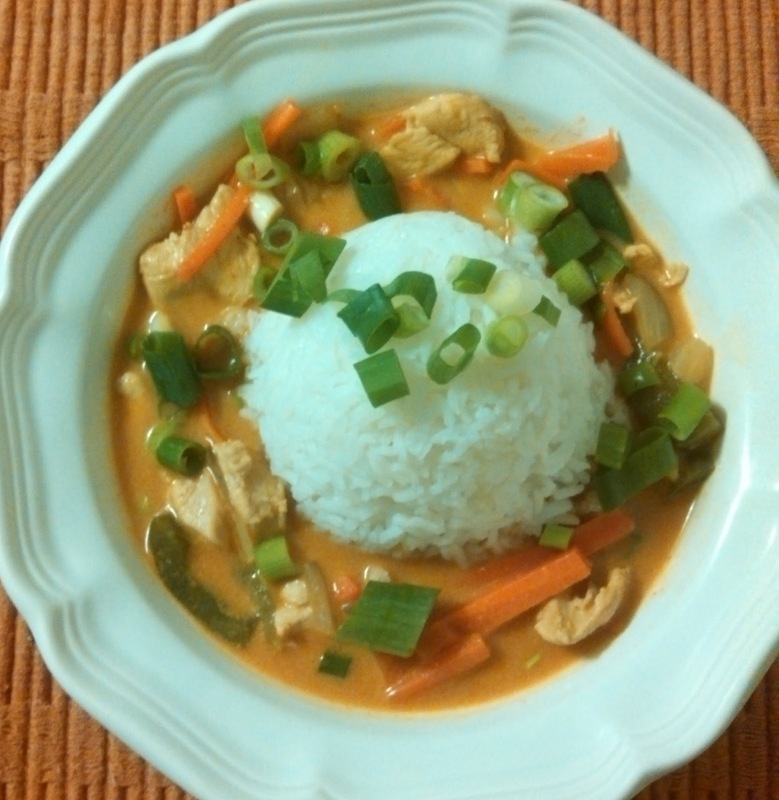 I was introduced to red curry back in Nebraska at our local Thai restaurant and fell in love. I think I could eat this daily! I finally have created a recipe that is very close to what I would get there. It is perfect for a cold day, or if you have a head cold because of the heat of the curry paste. It is a bit on the spicy side, so if you are not into spice you may want to adjust the curry paste in this recipe. 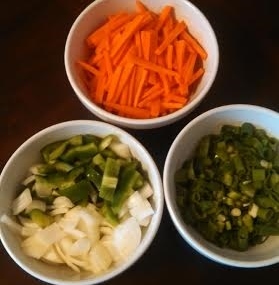 I had intended to go to the Asian store yesterday and get more authentic vegetables for the picture below, but although the weather was lovely here, we are in a winter storm warning and I didn't want to brave the packed stores with crazy people stocking up for the apocalypse blizzard. The nice thing is you can pretty much put in whatever vegetables you have available. I also apologize for the cell phone pictures, a new camera is in the budget, you’ll just have to bear with me until I save enough. Dice chicken, set aside. Chop carrots, set aside. Chop green pepper and onion, set aside. Chop green onion, set aside. In medium sized pot, heat sesame oil until shimmery. Add diced chicken and sauté until browned on all sides. Sprinkle with ginger, salt, and pepper. Slowly add chicken broth and coconut milk and bring to a simmer. Add curry paste, soy aminos, and honey. Add carrots and simmer for 5 minutes. Add onion and green pepper and simmer for another 5 minutes. Taste and add salt, if desired. Depending on the type of broth and soy sauce you use you may need to add up to ½ teaspoon of salt. You can also adjust spice if needed; adding more pepper or curry paste, if desired. Add green onions the last minute and serve over hot jasmine rice and garnish with Thai basil and lime. There are many other delicious vegetables you can add or substitute to this dish. Thai eggplant, bamboo shoots, or bean sprouts would all go nicely.